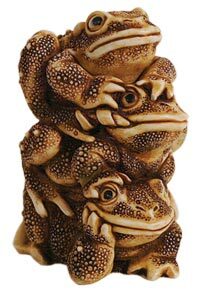 This trio of toads was carved by David Lawrence in homage to fellow HK artist Peter Calvesbert and his “Princely Thoughts” – Pete’s second small box figurine sculpted over a decade ago. Unlike “Princely Thoughts”, where the solitary toad has an expression of wistful expectation, this mischievious troika is full of playful abandon, except for the little fella on the bottom who patiently awaits his turn to be on top. From the looks of this piece, you would never know that toads are actually shy nocturnal creatures. 129 carved into the lid lip signifies that this is carver David Lawrence’s 129th HK box figurine. Peek inside for the fourth plucky fellow.